Lake near the Arctic Circle. A turn will bring us to the banks of the Coppermine River which we will follow up to the sea shore and Kugluktuk (Coppermine), an inuit village in Nunavut. During the first third of the crossing a stop will be organized at Gameti (Rae Lakes), a First Nations community. 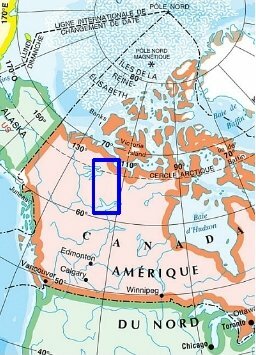 - 500 km to reach Kugluktuk located on inuit territory. Marie-Hélène Fraïssé is the godmother of the expedition. Journalist, writer, reporter and radio producer at France-Culture, she has established the french edition of the Samuel Hearne's journal in 2002. Our overall budget reaches 25000 €, including the whole required equipment, clothes, food, fuel, flights and transportations, communication and insurances.